Hong Kong Exchanges and Clearing Limited (HKEx) and The London Metal Exchange (LME), part of the HKEx Group, have today announced the appointment of Garry Jones as the Chief Executive of the LME to succeed Martin Abbott, whose resignation was announced in June. Mr. Jones will be appointed to the LME Board. According to HKEx, Mr Jones is expected to join LME on September 30 this year, subject to the approval of British financial markets regulator, the Financial Conduct Authority (FCA). Upon taking up the position as LME’s Chief Executive, he will also become HKEx’s Co-head of Global Markets and a member of HKEx’s Management Committee. Mr. Jones has over 30 years of experience in exchanges and financial services and was most recently Chief Executive Officer (CEO) of NYSE LIFFE, and Group Executive Vice President and Head of Global Derivatives for NYSE Euronext. His career at LIFFE focused on soft and agricultural commodities trading with physical delivery; market participants comprised producers, trade buyers, intermediaries and brokers as well as the investment community. Previously he had been CEO of Brokertec Europe and ICAP Electronic Broking after a stint in trading and business management in the UK and US across a number of investment banks and hedge funds, including Japan’s Daiwa Securities, France’s Banque Paribas and Merrill Lynch. Mr. Jones has been a member of the board of directors of the Qatar Exchange, LCH.Clearnet Group and the Federation of European Securities Exchanges. 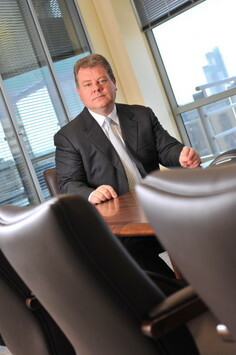 He was a founder member of the Futures and Options Association’s European Industry Council and was a member of the senior level Practitioner Panel that advised the Financial Services Authority on new policy initiatives under the UK’s former regulatory regime prior to its succession by the Financial Conduct Authority. Mr. Jones holds Bachelor and Master of Arts degrees in Geology from Oxford University in the UK and a Master of Business Administration degree from the Stanford University in the US. At the same time, Diarmuid O’Hegarty, LME’s Deputy Chief Executive, has informed HKEx and the LME of his decision to resign. His resignation will take effect following service of a six month notice period. Mr. O’Hegarty joined the LME in 1998 and was appointed Deputy Chief Executive in 2012, having previously served as Director of Regulation and Compliance. He has served as a member of LME’s Executive Committee and of HKEx’s Management Committee. Throughout this time, Mr. O’Hegarty has served the LME and the HKEx Group with distinction. Charles Li, Chief Executive of HKEx said: “We are very fortunate to have been able to attract a tried and tested leader of Garry’s calibre. Garry has deep experience from both NYSE LIFFE and ICAP of leading complex businesses and has been at the heart of some of the most transformative developments in the exchange sector. We started our search process looking for a leader of the LME but I am convinced that we have succeeded in attracting someone who will also help to shape the direction of the entire HKEx Group. “I would also like to thank Diarmuid, who has been a significant contributor to the success of LME’s integration into the HKEx Group. He will be sincerely missed and I wish him all the best for the future” concluded Mr. Li.